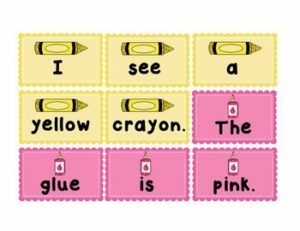 This center includes school supply sentence cards that students will use to put a sentence in order. Students will use capitalization, punctuation, and content to organize the sentence into the correct order. Students are able to use two different extension worksheets. In the first, the students will record the sentences next to the appropriate school supply picture. In the second, students will create three original back-to-school sentences. One with a period, one with an exclamation point and one with a question mark. This literacy center can be printed and laminated for durability. This product is great for first grade, RTI, special education, homeschool, and for any child that needs extra practice in unscrambling sentences! If you loved “Back-To-School: Scrambled Sentences”, you need to take a look at these games and activities! Check out more back-to-school products here!